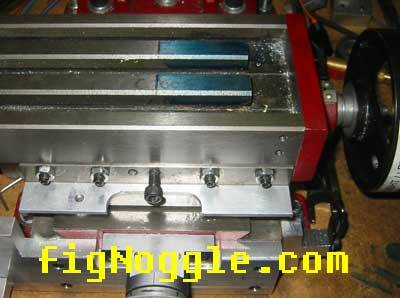 After modifying the stock nuts on my mill i improved the backlash some. now that months have gone by, things began to get a little sticky at the ends of the X and Y travel. It just required a little extra oomph to go the extremes. So it was time to take things apart and see what's what. Here's what i found. 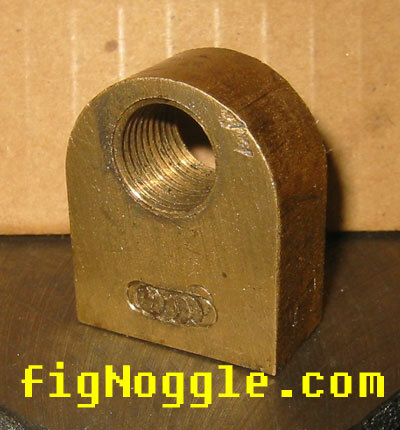 stock nut. this was pre-modification as described in the how-to. notice the threads now. see how it's mangled? not good it basically only has a few good threads. but wait. here's how we got here. you'll need to remove the table. 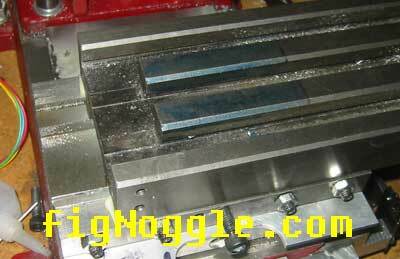 if you have the figNoggle Designs' CNC Conversion and our DRO installation, you'll need to remove the X-axis motor plate from the end of the bed and the DRO scales. loosen the gib set screws a little and begin to crank the wheel until the bed is cranked out like you see. so, we take some 150+ wet/dry sandpaper and apply some water to it. the paper's on a 1/2" thick metal plate. start lapping a bit until the material build up goes away. now it's better. smoother. do the same with the Y-axis. be patient and do it right. you'll need grease for this as well. now let's put things back together. we'll start with the Y-axis. 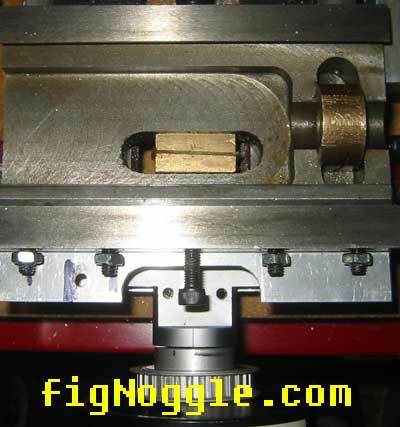 start by loosening the two bolts that hold onto the Y-axis leadscrew retaining block and the set screw for the nut just a hair. also make sure the gib is not tightened down. make sure you have the handle screwed on jut good enough to have no play but be able to rotate freely. if you had four hands you'd be able to dial things in pretty quickly. since we're only human, we'll have to make finite adjustments until it feels "right". crank the wheel all the way towards you. start tightening a bit on all screws. crank all the way to the other extreme. if you start feeling a build-up of resistance, undo the gib and nut set screw a bit. go back and forth until it feels right. this takes time. 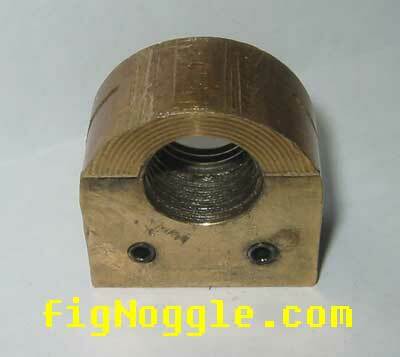 since we've modified the nut and cut away at some material, we decided to shim the nut a bit. this is not necessary, but this .001" thin shim lets us control the angles a bit. it helped. ok, the Y-axis is dialed-in. put the nut in the cavity. grease it. while eyeballing it, lift and center the nut. tighten the two set screws just enough so that the screw doesn't fall back down. 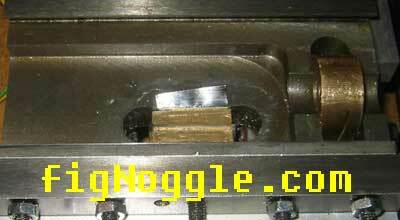 the purpose of this is the help align the leadscrew. make sure the leadscrew is fitted properly with the handle in its place. it should spin freely (click for video) and not have any axial play. if the nut was centered well enough you should be able to just slide the table into the dovetails (the gib was put back in its place and the set screws loosened) this far before the threads should be engaging. 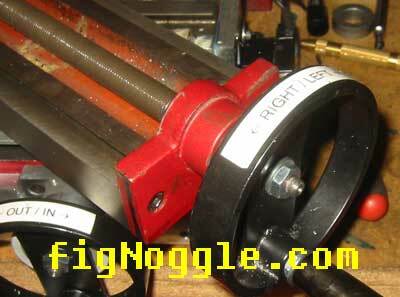 if you have problems lining up the leadscrew and bed assembly, go back and adjust the nut. start with one end of the table and work your way back and forth until it feels right. there should be no play and/or backlash. you may have to adjust the gibs and nut set screws many times during the extremes and middle of the table travel to get it right. doing so will not only reduce binding at the extremes of table travel, the accuracy is more predictable (good for cnc), and overall manual operation becomes "smoother".